LOCATED AT 330 RIDOUT STREET NORTH BY YORK STREET. Design/build addition and renovation to family home near Port Stanley, Ontario. One of the perks over the years of being a homes writer is the access I've enjoyed to an enormous range of dwellings. From converted school houses in the country to sleek condos for urban professionals, I've been fortunate to experience a variety of lifestyles represented by the homes that were renovated or designed with input from their owners. 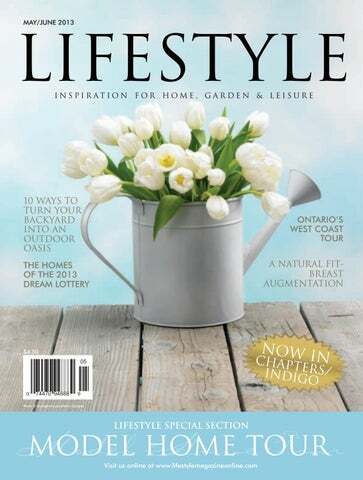 In this issue of Lifestyle, we've featured a tour of model homes from Grand Bend to St. Thomas. They include a golf-themed condo community, a bungalow without steps and a suburban home with European flair. Touring model homes not only provides prospective homeowners with an opportunity to see what's available, but it's also a chance for others to glean decorating ideas that can be adapted to their home or apartment. We've also profiled another interesting model home – the London Home Builders' Association's Green Home, built in Ballymote Woods with many services and materials donated by local businesses. The two-storey home demonstrates many green technologies, including carpets manufactured from recycled pop bottles and a grey-water recovery system that collects water from showers and laundry, filters and chlorinates it, and pumps it back to the toilets for flushing. Proceeds from the sale of the home, priced at $450,000, will benefit the Cancer Survivors Garden at Wonderland Road and Riverside Drive. If you're planning day trips this summer, you'll want to read Ellen Ashton-Haiste's feature that takes readers along with her on a tour of Ontario's West Coast. Ellen explored bed-and-breakfast inns, antiques shops, artisans studios and casual fine-dining restaurants, many situated in historic homes. The tour starts in Exeter and ends in Bayfield, giving readers a chance to see nearby attractions in a new light. On that topic, many businesses in the London region are world leaders and we've included several of them in this issue. Hollandia Pools and Spas, for example, constructs large-scale public pools and water parks for municipalities and institutions across the country. Ice Culture, a small family-owned company in Hensall, sends crews around the world to design, build and install sculpted ice creations, including a 37-foot-tall Disney Castle erected in New York City's Times Square last October. This photo: The focus of the kitchen in the Wastell home is the central granite-topped island lit by dramatic pendant lights. Imagine living your dream and, at the same time, helping someone else, who thought it might not be possible, to live theirs. That's what can happen for the fortunate winner of the 2013 Dream Lottery, which has raised more than $22.6 million since 1996 for St. Joseph's Health Care Centre and the LHSC Children's Hospital. The three homes on offer as this year's grand prize are likely to suit any lifestyle, says Rita Fieder, Dream Lottery manager. They include a cottage-style home in Grand Bend's Pinery Bluffs, a spacious north London family residence or this year's addition of a downtown condo suite. The winner also has the option of taking $1 million in cash. This year's lottery includes a new feature. â&#x20AC;&#x153;For the first time in Ontario, we are going to increase the excitement of a hospital lottery with a 50/50 pot that can grow up to $1 million or more,â&#x20AC;? Fieder says. The 50/50 Plus draw, with a minimum purse of $100,000, is available to Dream Lottery ticket purchasers. In north London's Meadowlands of Sunningdale neighbourhood, the Wastell Homes' residence is a study in relaxed elegance, with upscale detailing and an ambiance that welcomes a laid-back family lifestyle. At the heart of the airy and spacious 5,400-square-foot home, decorated by Myra Tuer, is the open-concept great room and kitchen. A two-storey wall of windows in the great room, overlooking a rear yard, community pond and rolling farmlands, is built in stacked squares to mirror the coffered ceiling, builder Doug Wastell points out. A gas fireplace, set in a granite surround, is flanked by entertainment cabinetry. The kitchen, by Casey's Creative Kitchens, features a walk-in pantry, granite counters and an island with workspace and a breakfast bar, beneath dramatic pendant lights, as well as a separate dining area. and leads to a sizeable walk-in closet, set behind a feature wall. A second bedroom in this wing has been created as a girl's room and incorporates its own ensuite bathroom and a balcony playroom above the foyer. The second wing comprises two bedrooms, themed for boys, and connected by an ensuite bathroom. In the lower level, nine-foot ceilings, full-height windows and a walkout to the rear yard preserve the spacious ambiance evident throughout the home. A family room includes a gas fireplace and leads to a games area with pool and shuffleboard tables. Two additional rooms, flanking a bathroom, could be craft or hobby rooms or even a nanny suite, Wastell says. Above: The ensuite bathroom in the master bedroom retreat features a free-floating vanity backed by a floor-to-ceiling mirror, a free-standing tub and a make-up area. Perched high above downtown London, at the corner of Ridout and King streets, is the newest Dream Homes addition – a luxurious condo in The Tricar Group's brand new Renaissance II high-rise. The two-bedroom suite, decorated by Mary AllenJovichevich and furnished by Kingsmill's, is an ideal location for professionals who work in the city's core, says Donna Grbich, client relations manager with Tricar. “In fact, that is the clientele we're primarily seeing,” she says. The 1,507-square-foot space is open and bright, with large windows on two walls of the open-concept kitchen and living/dining area. Patio doors open to a 184-squarefoot concrete balcony that includes an outlet for an electric barbecue. The kitchen features granite counters – repeated in the bathrooms – and a ceramic backsplash with stainless steel appliances. The suite includes upgraded hardwood flooring in the kitchen and living/dining room, with area rugs added as a decorative detail. The bedrooms feature plush carpeting. The flooring in the den is engineered hardwood and the bathrooms and foyer have interlocking mosaic porcelain tiles. Across from the kitchen, a cosy den provides comfortable space for private relaxation. A laundry area is tucked away off the main foyer. A hallway from the foyer leads to the master bedroom and also leads to a large walk-in closet and an ensuite bathroom. The unit includes its own air handler for heating and airconditioning temperature control. An electric fireplace in the living/dining area adds warmth and ambiance with remote-controlled temperature and flame settings. The building is secured with state-of-the-art circuitry and is monitored by on-site managers. When guests buzz for entry, the signal goes to a cell phone and they can be admitted, whether the owners are home or even out of town, Grbich says. Residents also have unlimited access to the building's common areas. These include a fully equipped exercise room, library and media room with a 60-inch television and theatre-style recliners. There is also an expansive lounge/party room, complete with a full kitchen and bar that can be used for social events or booked for private gatherings. It opens to an outdoor oasis that includes barbecues, garden areas and a putting green. The building also has two extensive guest suites to accommodate visitors. Outdoor enthusiasts will love the natural setting and rustic charm of the Grand Bend home in Pinery Bluffs, bordering Pinery Provincial Park. The 3,900-square-foot Craftsman/traditional bungalow by Nicholson Builders exudes a warm and comfortable ambiance offset by some distinctive detailing. This is immediately evident on entering the home. The foyer features an 18-foot ceiling, stretching up to a dormer window above a transom that floods the entry with light, says builder Rod Nicholson. In the great room, Nicholson has created a two-tiered ceiling accented with pine beams. A decorative stone surround forms a dramatic backdrop for a gas fireplace and a flat-screen television above. A covered deck is accessible by french doors from the great room and from the master bedroom. Outdoor elements include a wood fireplace constructed with manufactured stone, which is also used as accent brick on the home's exterior. Decorative armour rock, from the Bruce Peninsula, and interlocking stone for the driveway complete the landscaping. Inside, the main floor features rich maple hardwood flooring. A maple staircase leads to the lower level where designer RaeAnn Ladouceur This photo: has created a recreation retreat â&#x20AC;&#x201C; a games room with a pool table, dart board and dry bar and a comfortable family room with a gas fireplace and television, flanked by painted wood cabinetry. There are also two additional bedrooms and a workshop on this level. By Ellen Ashton-Haiste There are the sunsets! The light shows of gold, red, purple and orange veins sinking into tranquil Lake Huron waters is a sight that attracts thousands of visitors annually to Ontario's West Coast, otherwise known as Huron County. But beyond the beaches – stretching from Grand Bend through Bayfield, Goderich and beyond – this area offers an abundance of delights. Charming towns and quaint villages, set in a pastoral panorama, are home to antiques and artisans, history and culture, unique shops and recreational adventure. ... AND HERE WE GO Come with us as we explore a few of the highlights. My tour of Ontario's West Coast started in a delectable way with lunch at Eddington's of Exeter, on the main street of this town midway between London and Clinton. Set in the historic Carling homestead, built in the 1870s – by a family related to the famous brewers, notes owner James Eddington – the restaurant radiates an ambiance of comfort and elegance to set off its casual fine-dining fare. Eddington opened the restaurant in 1997 and has added a new dining room and a backyard summer patio. Local food was a hallmark at Eddington's before it became the “movement,” now gaining traction in the culinary world. “We use local food as much as possible,” the owner says. With staple items including Hayter's turkey, Ontario Black Angus beef and Lake Erie yellow perch, the menu offerings change frequently to reflect other available Huron County bounty. These are paired with wines from around the world as well as from several Ontario vineyards. Eddington also supports his community, offering dinner packages paired with local events. This summer he's teaming up with Exeter's second Bach Festival of Canada, July 14-20, and throughout the season with Drayton Entertainment for productions at Grand Bend's Huron Country Playhouse. My immersion into the region's rich history continued at Clinton's Kildonan House Bed & Breakfast, a heritage home built in 1867 in the traditional Italianate style, with a wrap-around verandah perfect for relaxing summer evenings. The interior features 12-foot coved ceilings, honey-pine flooring and a cherry staircase. Antique chandeliers and furnishings, some dating to the late 1700s, enhance the historic charm. “Charming” is also a perfect word to describe hosts Gene and Maureen Logel, who make visitors feel instantly at home with welcoming smiles and easy conversation. The four guest rooms all include private bathrooms and wireless Internet. I stayed in the Ambassador Room, an elegant chamber with a mahogany half-tester bed – complete with canopy and side draperies – and a mahogany armoire, both dating to the 1850s. Breakfast was hearty and filling, including eggs, bacon, homemade muffins and yogurt with fruit, served up with delightful chitchat that invited lingering over coffee. HISTORIC SEAFORTH En route to my first stop, I drove through Seaforth, a mid-19thcentury railway town and grain centre about 10 minutes southeast of Clinton. Following an 1876 fire, which destroyed 12 acres of the business district, the main street was rebuilt in brick and block structure, a Victorian style of architecture that remains today and has resulted in the street's designation as a Heritage Conservation District, one of the oldest in the province. Seaforth is being featured this spring in iBroadcast Internet Television's Rediscovering Canada. At first blush, the sprawling rustic house on the country road, surrounded by fields and wood groves, seems an unlikely location for an award-winning artisan studio. But this renovated general store, near the hamlet of St. Columban, is where Robert Tetu has been creating one-of-a-kind pottery for more than three decades. Surveying his pieces, ranging from large bowls and vases to delicate liqueur glasses, one characteristic that stands out is the distinctive rich colours, often seeming to reflect the hues of the surrounding natural elements. This is part of his signature. All potters create unique styles and colours, he says. “You should be able to walk into a gallery, see a piece, and say 'That's Robert Tetu's work. '” Mixing his own glazes, using natural ingredients, he has created a personal colour palette. Tetu continually pushes boundaries to create new forms and designs. “It's a constant challenge, but I like the challenge,” he says. While his work is shown and sold in galleries around the province, customers do seek him out. But the studio is open only “by appointment or chance,” he says. So it's advisable to call ahead. Heading north to Blyth, a worthwhile stop is The Old Mill. Located on Hwy. 4, a mile south of the village, it's Ontario's go-to location for leather and wool products. The family business, founded in 1960, boasts its own tanneries that produce leather jackets – in hundreds of styles and sizes up to 4X tall – and wool blankets. The business is famous for creating the first-in-North-America washable sheepskin. In fact, sheepskin is an Old Mill specialty. In addition to its fashion offerings, The Old Mill features a range of products including hats, shawls, luggage, footwear, leather handbags and briefcases, and accessories such as gloves in leather, sheepskin or wool. One could easily spend several hours browsing through the galleries that stretch through two buildings. Arriving in Blyth, it's time for a lunch break and an ideal location is Part II Bistro, a new eatery across the street from the Blyth Festival Theatre. Owners Peter and Sarah Gusso had opened the Station House B&B in the village and found themselves doing a considerable amount of catering. So they decided to “go bigger,” Peter says, drawing on their experiences travelling through Great Britain where they observed and absorbed the culinary traditions with the idea of one day opening their own venue. Part II is the realization of that dream. No summer visit to Huron County should be complete without taking in a production at the Blyth Festival. Founded in 1975 to produce professional repertory theatre reflecting the culture of Southwestern Ontario and beyond, the festival has become known for its creation of new works. Today, the Blyth Centre for the Arts, a year-round centre of cultural activity including an art gallery, showcases professional and student exhibits, and is home to the professionally led Blyth Festival Singers and Blyth Festival Orchestra. This summer's theatrical offerings include Beyond The Farm Show, a “collective” production, created by actors visiting local farms and coming together to improvise a play based on the sights, sounds and characters of the barns and homes of Huron County. This theatrical process was pioneered in Blyth with the original The Farm Show, headed by renowned director/playwright Paul Thompson. Other 2013 productions include a remount of last year's Dear Johnny Deere, based on the music of Fred Eaglesmith, and Garrison's Garage, premiered at Blyth in 1985 and toured around the province to critical acclaim. BETWEEN BLYTH AND GODERICH Heading back to Goderich on Blyth Road, the Carlow General Store features an eclectic collection of antiques and kitsch, new and used, old and retro, from dog sleds to Esso diesel gas pumps. “It's exciting! Every day something new comes in,” says owner Lynn Depatie. One of the most unusual she's seen is a 1918 time-keeper box for prison guards. Depatie bought the empty store four years ago and turned it into an old-fashioned trade-and-bargain mercantile. “I've worked in retail since I was 15. It's in my blood,” Depatie says. The store, open 7 a.m-9 p.m., seven days a week, also carries grocery items for local residents. Perched atop a hill at Saltford, on Goderich's northern boundary, and overlooking the Maitland River Valley, Samuels is an ideal base for exploring the town and environs. The boutique-style hotel, with upscale touches including in-room fireplaces, private terraces and complimentary continental breakfasts, is meeting a need for business travellers as well as summertime family vacationers, says owner/manager Kim Burgsma. Burgsma, an award-winning landscape designer, and her husband, Hugh, opened Samuels in July 2010. Operating a hotel is something they had talked about over the years. With the children grown and the availability of a former banquet hall in what the Burgsmas considered a “perfect location,” taking the plunge was “a matter of timing and opportunity,” she says. In addition to the 14 main-floor rooms, the hotel features a second-storey, twobedroom furnished suite with a full kitchen and an expansive deck that affords panoramic views of the river flatlands. The hotel is named for two of the town's fathers of industry: Samuel Bisset, an early 20th-century Saltford dairy farmer whose Holsteins were world renowned, and Samuel Platt who, in 1866, discovered the salt deposit that gave birth to today's Sifto Salt Mine. In addition to a reputation as Canada's “prettiest town,” Goderich is one of the region's most historic, with a wealth of heritage homes and historic buildings (albeit a few fewer in the wake of the famous August 2011 tornado). One place to explore heritage architecture and historic items is Jane Egan Antiques. Egan's collection includes china, glass, quilts and linens, as well as silver and garden accessories. And it's set in one of the town's oldest homes, Galt House, a Georgian-style designated heritage home built circa 1855 that's remarkably well-preserved inside and out. It was home for some 40 years to John Galt VI, grandson of John Galt, the founder of Goderich. Egan's in-home shop is open year round, by chance or by appointment. Featuring Cool Action™ Gel Memory Foam – the world’s first memory foam infused with the support and cooling touch of Serta’s MicroSupport™. This revolutionary new memory foam is designed to deliver superior pressure relief and more targeted support while sleeping cooler than ordinary memory foam. START SPRING CLEANING WITH YOUR DRIVEWAY. MAKE ROOM FOR THE BMW 5 SERIES WITH xDRIVE ALL-WHEEL DRIVE WITH LEASE AND FINANCE RATES OF ONLY 1.9%. For a limited time, drive home the BMW 528i for just $598 a month. It comes equipped with xDrive® All-Wheel Drive and are available from just 1.9% for 48 months. Or you can take advantage of a cash purchase incentive of $2,500. But hurry, this offer ends June 30. Visit BMW London for details today. 2013 BMW 528i XDrive shown. European models shown. Features and equipment may vary in Canada. Selling price for a base model 2013 BMW 528i xDrive All-Wheel Drive starts at $59,518/$64,418 which includes MSRP ($56,900), freight and PDI ($2,095), Dealer administration fee (up to $395), A/C Levy ($100), OMVIC fee ($5), and tire stewardship fee ($23.36). Applicable taxes, licence and registration are extra. Retailers are free to set individual prices and charge administration fees, which may change the APR or the price of the vehicle. Retailer order/trade may be necessary. Offers are only valid for Ontario residents until June 30, 2013. *Lease offers are available through BMW Financial Services Canada only on approved credit (OAC). **Lease example: Base model 2013 BMW 528i xDrive All-Wheel Drive ($56,900) leased at 1.9% for 48 months. Monthly payment is $598, with $8,180 down payment, which includes freight and PDI ($2,095), Dealer administration fee (up to $395), A/C Levy ($100), tire stewardship fee ($23.36), OMVIC fee ($5) and PPSA ($55.40). First month’s lease payment and security deposit of approximately one month’s lease payment are due on signing. Taxes, licence, insurance and registration are extra. Residual value at lease end is $25,605 plus taxes. Annual kilometres limited to 12,000; $0.15 per excess kilometre. Purchase finance/lease APRs include the incentive for cash customers, which is only available to customers who do not purchase finance/lease through BMW Financial Services Canada at a special rate, as a cost of borrowing. Effective Lease is 3.64% APR for 48 months (for informational purposes only). ***$2,500 cash purchase incentive is available to cash buyers only on all new 2013 BMW 528i xDrive All-Wheel Drive models. Incentive for cash customers are available for all BMW retail customers except customers who lease or purchase finance through BMW Financial Services Canada at a special rate of interest offered as part of a low rate interest program. All advertised lease and finance rates are special rates. Offers valid on retail delivery of select new and unregistered BMW vehicles, when purchased from a London BMW retailer. Cash incentives include an amount on account of sales tax and are applied after sales taxes have been charged on the full amount of the negotiated price. †New 2013 BMW vehicles purchased from an authorized BMW Retailer in London are covered by a No-Charge Scheduled Maintenance plan for four years or 80,000 km, whichever comes first. Certain limitations apply. Contact your BMW Retailer or bmwlondon.ca for full details. ©2013 BMW Canada Inc. “BMW”, the BMW logo, BMW model designations and all other BMW related marks, images and symbols are the exclusive properties and/or trademarks of BMW AG, used under licence. A wedding dress circa 1900, a turn-of-the-century brass light fixture, country formal furniture, rocking chairs and painted pieces – all this and more can be found at Ringwood House Antiques at Holmesville, east of Goderich. The shop is operated by Connie Egan, mother of Jane. In fact, the mother-daughter team once shared their business at Galt House. Connie has been in the business for four decades and has seen drastic changes in the antiques marketplace. Offshore imports have taken a toll and young people today “want the look, not the age,” she says. Nevertheless, some pieces hold their value, such as gold and silver jewellery. And with other items, the pendulum swings back and forth. Anyone who thinks blacksmiths are historical relics, found primarily in pioneer villages, might think twice after visiting Sharp's Creek Forge, east of Goderich. Here, artisan Jim Wallace creates striking and elaborate works of art – from wroughtiron fencing for historic homes to decorative light fixtures, door grilles and even shower enclosures – using the time-honoured skills of heating and hammering metal with a forge and anvil. In fact, artisan blacksmithing is experiencing a renaissance, Wallace says. The ArtistBlacksmiths' Association of North America now boasts nearly 5,000 members, double that of a decade ago. Wallace was inspired to take up the craft by his father, a local doctor who enjoyed blacksmithing as a hobby. “That's where the spark happened,” he says. Following the 2011 tornado, Wallace used his skills to create a lasting tribute to the mature trees that were lost to the storm. The sculpture, now established in Harbour Park, was commissioned by local physician Dr. Jim Hollingworth. Bearing the words “Nature giveth and taketh all,” one side depicts the barren landscape created by the loss while the other shows the beginnings of the rebirth of nature through regrowth. To see Huron County through the eyes of an artist, the place to visit is Elizabeth's > 519 - 6 3 3 - 010 7 < Art Gallery on the Goderich Square. Here, Elizabeth Vandenbroeck displays her photography and paintings. She Briwood Farm Market Inc – also does custom framing, sells art supplies, holds workshops and hosts a camera 1/12 page – Mar/Apr issue Mudges_12th_MJ13.indd 1 4/22/13 10:35:30 AM club. Her art is all about the county. “I'm really tied to this area. I grew up here. I try to (logo – attached) make things I have a connection to, so they're meaningful to me.” Fresh,So Local Fruits & She prefers natural settings and tries “to make them timeless. I tend toVegetables avoid Local Meats • Fresh, local fruits & vegetables things that show a stamp of human presence, (like) buildingsIn-Store and cars.” Bakery • LocaL Meats so much more! Vandenbroeck has been on the Square for 20 years, the &last 10 in her current • In-store Bakery & so much more! location. Stop by today to experience the The lower level of her building is home to the Goderich Co-Op Briwood way! Gallery, a stop by today to collective of local artists – currently 15 – who display works in various media. 1030 Talbot Street, St. Thomas, ON experIence the brIwood way! Each month, a rotating exhibit features a particular artist or cause. (519) 633-9691 1030 Talbot St., St. Thomas, ON 519-633-9691 Vandenbroeck also hosts special exhibits. She's working with the local women's shelter to create an Art As Healing exhibit, to run through May. Set in a Victorian-era home, Thyme on 21, with its casual fine-dining fare, is perfect for a relaxing dinner after a day of sightseeing. Originally Robindale's Fine Dining, it was purchased in 2004 by current hosts Peter King, a Goderich native, and his wife, Katherine. King says they have endeavoured to create a welcoming atmosphere where everyone feels comfortable, but still highlight the home's historical character. Chef Terry Kennedy, also a Huron native, serves up mouth-watering creations featuring fresh local and seasonal produce combined with a global influence, such as the popular Nova Scotia scallops paired with local maple syrup in a Dijon cream sauce. Dream bed, dream bedding and mattress to dream on... Our design team will help create that “forever” dream home for you to enjoy for years to come. “We were Celtic before Celtic was cool.” Eleanor Robinson is talking about Goderich's annual Celtic Festival, now in its 21st year, which she and her husband, Warren, co-founded. It's the oldest Celtic festival in Canada and also pre-dates the two big ones in the world, held in Scotland and Cape Breton, N.S. The festival draws thousands of tourists to Huron County each August. The weekend festival, set this year for Aug. 9-11 in a park overlooking Lake Huron, showcases the world's best in Celtic music and dance on five stages and artwork by some three dozen artisan vendors. Chosen by a juried process, the vendors offer hand-made, one-of-akind pieces. Entertainment is brought in from around the world. Making first-time appearances this summer are the celebrated Brock-McGuire Band, from Ireland's County Clare, and The Fretless, a young Winnipeg-based group making folk music with three fiddles and a cello. The weekend is the culmination of an entire Celtic week. Three years after the festival started, the Celtic College was launched, offering five days of courses in music, art, crafts and more. The college is open to anyone over age 13, but there's also a week-long Celtic Kids Camp for youngsters aged four to 12. The ideal place to end a tour of Ontario's West Coast is the picturesque village of Bayfield, south of Goderich on Hwy. 21. Perched on a bluff, overlooking the Bayfield River, it's the busiest Canadian port on Lake Huron, a haven for both fishing boats and pleasure craft. Its main street is an eclectic collection of galleries, boutiques and dining establishments from casual to gourmet. Art galleries and studios offer a selection of paintings, photography and sculpture. Main Street Gallery, for example, has original paintings, photography, ceramics, glass, textiles and wood carvings created by award-winning Ontario artists, while Marten Arts represents more than 100 established and emerging artists in various media. Intrepid shoppers will find anything from high-end fashions and accessories to home decor and giftware. A couple of places worth checking out are Sweets n' Treats, specializing in handmade chocolates, and The Village Bookshop, an independent book seller surviving in the technological age and host of the annual Bayfield Writers' Festival each June. When it's time to relax and refresh, there are plenty of options, including the elegant Little Inn, The Docks – the only waterfront restaurant – the popular Black Dog Village Pub and Bistro, and the Albion Hotel, known for its perch entrees. We lunched at ArtSee Cafe and Bistro, a colourful and funky venue that serves innovative “fresh and healthy food” with the option to take home favourite menu items. 302 Bridge St., Port Stanley • 519-782-7247 OPEN YEAR ROUND! Inside-Out, there’s a bit of home! Southbound launches Miik! Miik uses eco fabrics to create striking yet simple pieces that are flattering on every body type and feel unbelievably soft against your skin. port stanley fashion to craft items and high-end artistic pieces. And Port Stanley Festival Theatre offers great professional theatre, including drama, comedy and toe-tapping musicals throughout the season. Events to watch for include the Gallery Artists Open House, May 18, hosted by the Association of Port Stanley Artists, and the annual CANFEST, June 29-July 1, with fireworks, car and motorcycle shows, a kids' treasure hunt, cardboard boat races and more. Your quest for the dress starts here! 100â&#x20AC;&#x2122;s of styles for work or play and the perfect accessories to choose from. Could you please make the following changes: 1)My Name text: Tiffany Richter.... smaller font (1 size) and under my feet area please. 2)Do you have the scroll work in black from the previous ads the filigre style for the top right corner. 3)The dot dot dot under my store name to divide the text should be swirl design or filigre design in black, fancy, not contemporary as the dots portray. All of us are longing to be outdoors, enjoying the warm weather in our backyards, and relaxing and entertaining friends and family. Our backyards have become functional extensions of our homes, adding valuable living space. By carrying the colours, style and furnishings of our interiors outdoors, we create a natural flow to our homes. Lifestyle has 10 great ideas to help you enhance your outdoor space and transform it into a wonderful place to read a book, savour a glass of wine, and just enjoy the sights and sounds of summer. Your backyard oasis will seem more like a welcoming retreat if you screen views of neighbouring yards. Section off an area and create a sense of privacy with lattice walls, pergolas, fences and landscaping. Add outdoor music and heaters, and your private getaway will be complete. A new structure in your yard will define spaces and add an architectural element. Deciding on the activities that are important to you will help you create the type of structure that suits your oasis. A gazebo is a perfect place to offer protection for dining and cooking. Arbours and trellises help to separate areas and define their function. DESIGN A WELCOMING SPACE This is where the use of texture will allow you to display your personal style. Stores are well stocked with colourful umbrellas, cushions, pottery, place mats and table settings, so pick your favourite summer colour scheme and have fun bringing it to life. Don't forget to add garden planters to complement the decor and invite nature into your space. Everyone needs a welcome escape from the summer heat. This is an area where mature trees, retractable awnings, pergolas or arbors covered with lush vines will beautify your yard and create a cool, breezy escape. CREATE A FOCAL POINT Fire pits, fountains and outdoor fireplaces will create a natural focal point that will draw guests together in conversation. Listening to the trickle of a waterfall or the sounds of a crackling fire will add hours of enjoyment to your oasis. An outdoor fireplace will also enhance the seasonal use of your open-air space. Surround the area with garden statuary or decorative wrought-iron accents for visual interest. INSTALL OUTDOOR LIGHTING Planning outdoor lighting will not only extend the time you spend outdoors, but it will also allow you to add a sense of drama to the new focal points you have created in your yard. A spotlight at the base of a tree will create a beautiful night-time shadow effect. Light up the night in dining and cooking areas with wall-mounted down lights, outdoor electric lamps and hurricane lamps. A beautiful relaxing glow will surround your guests. Ray Catchers Sun Sails THE ULTIMATE IN U.V. PROTECTION! Create a deck with multiple functions. They could include a reading area with comfortable settees and chairs, a cooking area with a barbecue and an umbrella table, a sunning area with chaise lounges, and conveniently placed tables for beverages. Once these destination areas are defined, add an abundance of planters filled with blooming plants to give the deck a lush, tropical ambiance. Creating a summer feeling on your deck will be worth the effort as you relax and sip a tall glass of cold lemonade on a hot summer day. A hot tub will extend the use of your outdoor space, allowing you to use it as a year-round retreat and a place to welcome friends and neighbours for fun and conversation. A dip in the hot tub will rejuvenate you early in the morning and create a place to unwind just before bedtime. Remember to place your hot tub close to your home for easy access and year-round use. Contact us about our great specials on retractable patio/deck awnings. All here, waiting for you! NO PAYMENTS! NO INTEREST! 15 Months OAC. See store for details. The choice is endless when it comes to outdoor furniture. New synthetic wicker is durable and will bring years of outdoor use. Wrought iron, cast iron, aluminum and teak also offer a wide variety of looks that will complement the interior of your home. Waterproof cushions are now available in hundreds of styles and colours. Cooking outdoors will save energy and keep your home cooler in summer. Adding a small outdoor fridge and counter will make preparation easy. Outdoor kitchens can be as simple or as extravagant as you desire. Local retailers carry many versions of outdoor kitchens that are worth checking out. Sidewalks • Patios • Floors Driveways • Pool Areas Stamped • Exposed Aggregate Plain White Concrete Available in many patterns and endless colours! for porches, pool decks and garage floors. “We do a lot of work for backyards,” Feasey says. “People want a cosy, indoor type of feeling outdoors. Even their driveways are no longer just driveways. They're now masterpieces to the homeowner.” With a constant staff of 10 long-time employees and added staff during the outdoor season, Akko sees its daily business divided 50-50 between homeowners and contractors/renovators. While they take great pride in their concrete products, they also find satisfaction in the quality and popularity of their concrete colouring services. Rich, earthy tones including Granite Rock, Nutmeg and Old Rose – just three of a myriad of colouring choices – complement a diverse offering of concrete finishing at Akko. Above: Left to right are Richard Deakin (commercial product development), Todd McCormick (vice president), Eleana Ho (controller), Anna Passeri (sales/designer), Walter Schmoll (president), and Ron Bacon (service manager). NATURAL LIGHT PATIO COVERS ENHANCING HOMEOWNERS’ ENJOYMENT OF THE OUTDOORS By Kym Wolfe Most people want to enjoy natural sunlight safely and comfortably, and Natural Light Patio Covers allow them to do that by blocking 100 per cent of UV rays and 75 per cent of the sun's infrared heat rays. Ken Blokker, Natural Light Patio Covers' sales representative for Southwestern Ontario, is helping homeowners in the London region get more enjoyment out of their backyards. Natural Light Patio Covers has been manufacturing structures for the greenhouse industry for more than 20 years. In 2004, as homeowners started extending their living spaces outdoors, the company began to receive inquiries about whether they could modify their aluminum and acrylic structures to better suit residential uses. Since then, demand for the stylish backyard coverings has grown in leaps and bounds, says Blokker. Patio covers are the most popular products, but homeowners are also having acrylic walls installed to create three-season sunrooms, and putting freestanding coverings over pool areas. While the acrylic panels are engineered in Germany, all of the structural pieces are manufactured at Natural Light Patio Covers' factory in Dunnville, Ontario. The company now has dealerships in every province across Canada and has recently expanded into the U.S. market. Spring fashions are black, white and bright, with punchy prints and a rainbow's worth of bold colour spilling off the runway into local shops and boutiques. “Black and white are huge (colours) this spring worn alone and together,” says Jennifer Lofthouse, creative director at Leslie's Clothing. “Texture and asymmetrical panels of fabric and pattern also factor into many styles, including the latest dresses from Canadian designer Eve Gravel.” Bold blocks of colour, stripes and prints of all kinds on woven and knit garments help to set the strong seasonal tone toward mod, minimalist dresses and streamlined sporty separates. Bow-front, black-and-white sheath dress from the Riani Star Cut Spring 2013 Collection. Available at Susan J in London. Below: Geometric-patterned, sleeveless dress and scarf from the Riani Star Cut Spring 2013 Collection. Available at Susan J in London. Right: Blazer, trousers and dress from the Airfield 2013 Spring/Summer Collection. Available at Susan J in London. Pg. 5: Sleeveless dress with black centre panel from the Eve Gravel Spring/Summer 2013 collection. Available at Leslie’s in London. Right: Black-and-taupe, short-sleeved knit dress by Luisa Cerano. Available at Susan J in London. Below Right: Polka-dot jacket, skirt, belt, twinset, trousers and scarf from the Riani Star Cut Spring 2013 Collection. Available at Susan J in London. Below: Square cap-sleeved dress from the Eve Gravel Spring/Summer 2013 Collection. Available at Leslie’s in London. ORGANIC SKIN CARE is the very best! Above: Black cap-sleeved long dress from the Eve Gravel Spring/Summer 2013 Collection. Available at Leslie’s in London. FRESH START MATERNITY SUPPORTS Celebrating its 25th anniversary, Fresh Start Maternity Supports in St. Thomas is a living example of how a service group can bond with community to provide life's necessities to those in need. Operated by Rehoboth Girls' Home of Refuge and Support, Fresh Start provides a safe environment and support to pregnant and parenting women facing daily challenges. Women recovering from addictions, mild mental health issues, abuse and homelessness may also benefit from the structure and security offered at the St. Thomas home. A non-profit Christian organization, Fresh Start relies on an army of volunteers, with 75 per cent of its funding derived from charitable donations, says executive director Lori Wall. “We help women from across the province here in St. Thomas with 24-hour staffing and support. And now with the Bethesda Centre no longer in London, we are increasingly serving London women,” says Wall. Operating as a group home for 21 years in Springfield, Ontario, Fresh Start Maternity Supports changed its name in 2009 to reflect its current mission – providing a maternity home for women of all ages, races, ethnicities, personal faiths or socioeconomic status. While its Pregnancy Support Centre serves an important role for St. Thomas women only, other services housed under one roof provide a wide array of care. The group home at Fresh Start offers valuable information used in making life's choices within a safe, family-style environment. A case manager and caring staff are available around the clock. Referrals to counselling agencies are offered and transportation is provided to medical appointments. Prenatal nurse care, a labour coach to assist through delivery and a temporary residence post-delivery are all made available. Support Housing at Fresh Start offers three fully furnished oneand two-bedroom apartments for pregnant and parenting women. Mandatory programs, including prenatal care and life skills classes, are all complemented with 24-hour staff. Fresh Start welcomes volunteers and financial contributions so that it can continue to offer hope. or give us a call. We accept physical donations, financial donations and are always looking for volunteers. Now that the sunny spring days have arrived, prospective home buyers will be eager to tour model homes to discover what's available from area builders. There are many model homes to visit throughout the region. In the following pages, we provide a sampling of what's available in model homes from Grand Bend to London and St. Thomas. Your dream… …realized We make the home building process easy and enjoyable, just as it should be. Our dedicated team will guide you through the selection and construction process, providing expert advice and inspiration along the way. Sifton.com | 519.850.0756 CELEBRATING 90 YEARS - Choose 1 of 3 Anniversary Gifts! See a SIFTON Sales Rep for details. SOUTH WINDS DEVELOPMENTS DEER RUN, GRAND BEND The view through the patio doors of South Winds Development's model home in the Deer Run neighbourhood, south of Grand Bend, displays a canopy of greenery provided by tall savannah oak trees. The large lot – all lots in Deer Run are at least half an acre – provides a sense of privacy that's enhanced by the abundance of mature trees that have been preserved in the development process. However, neighbours are nearby in the established community, says developer Stacey Graham. The open-concept design and many large windows in the homes provide a comfortable space for enjoying this sense of seclusion and the surrounding natural elements. There's something a bit different about the houses Hayhoe Homes is building in the southeast St. Thomas neighbourhood of Orchard Park South, east of Fairview Avenue across from St. Joseph's High School. It might not be immediately obvious to the casual visitor, but those with mobility issues will notice it right away. These homes have no steps. The entryways – from the garage into the mudroom, from the kitchen to the rear covered patio and from the walkway to the front porch and doorway into the foyer – are all flush. The shower in the master bedroom ensuite bathroom is also barrier free, with a sloped floor and a slight rounded rise in the threshold that's easy for a walker or a wheelchair to roll over. Joe Hayhoe, a partner in Hayhoe Homes, says this feature is attractive to homeowners who don't want to draw attention to their disabilities. It has been a point of interest in the presentation centre at 102 Southgate Parkway over the past year. Two additional presentation centres, also with flush entries, are available for viewing – a town villa at 14 Hampstead Court and a condominium in the new 38-unit enclave site in Orchard Park South. ing in the kitchen, dinette, bathrooms and foyer, and broadloom carpeting in the bedrooms, hallways, and living and dining room. The master bedroom features an ample walk-in closet and an ensuite bathroom with a ceramic-tile shower enclosure. Soaker tubs are available in some plans. All homes are Energy Star certified and include a two-car garage, poured concrete porch, interlocking stone driveway and walkway, and a rear deck or a lower-level walkout. The exteriors are wood frame construction with stone or brick detailing. The homes are freehold and a $110-per-month condo fee covers snow removal and lawn maintenance. Prices starting from $378,000.00. See sales representatives for more details. Rendering is artist’s concept. Comfortable and contemporary with a hint of European style, Upper Richmond Village is London's first LEED-certified “new urbanism” community. The development is characterized by plenty of green space and walkable pathways as well as a commercial-residential mix that fosters a village atmosphere. That ambiance is evident in the houses that Rawlings Homes is building. The exterior of the company's two-storey model home has a European flair while the openconcept interior evokes a relaxed lifestyle with all the modern amenities, says builder Paul Rawlings. A spacious outdoor living area, a concept imported from the Southern U.S., allows homeowners to dine and relax from spring through fall. Anchored by a two-sided stone fireplace between the covered porch and the great room, the outdoor living area accommodates a flat-screen television. “A place to sit out on a nice evening, watch TV and relax,” Rawlings says. An upper-level activity centre, which Rawlings calls “a private family living room,” is another nod to family-centred living. The centre can be accessed from the bedrooms. The lower level has also been finished as “a comfortable getaway,” he says, with a family room, home theatre and heated floors. When you live at Cobble Beach, Golf is just one of the activities available on our award winning course. Relax at our full-service spa, play tennis, swim, work out in the fitness centre or take a walk in the Enchanted Forest. You can also enjoy an outstanding meal at our famous restaurant. After dinner, head down to our private beach and dock where you can take in a beautiful sunset across Georgian Bay. September 14th be part of the inaugural Concours dâ&#x20AC;&#x2122;Elegance at Cobble Beach, which shows more than 100 antique automobiles in pristine condition. Visit cobblebeach.com for more information on Cobble Beach and Concours dâ&#x20AC;&#x2122;Elegance. Taking it to the Top! 25 Years of Excellence Your Designs…Delivered More than 120 colours on display. More than 60 colours in stock. Traditional craftsmanship meets modern beauty: this is the essence of Woodecor, a custom cabinet manufacturer that takes pride in the originality of its designs. With a new, 1,000-square-foot showroom at its Stratford headquarters, Woodecor lives by the motto, â&#x20AC;&#x153;A family business with excellence in mind.â&#x20AC;? Owner-operator Lloyd Vandenberg founded Woodecor in Orillia in 1983 and then relocated to Stratford in 1988. For 30 years, the company has built a solid reputation for supplying fine woodworking to the residential, commercial and industrial sectors. The professional team, including Lloyd's wife and co-owner, Roberta Vandenberg, offers innovative designs in traditional, transitional and contemporary styles while creating a timeless product. From a high-tech fabrication centre, Woodecor manufactures kitchen cabinetry, vanities, closets and custom storage solutions, fireplace mantels, office furniture, custom furnishings, wall units and bars. “We are a forward-thinking cabinet company,” says Roberta Vandenberg. “We think outside the box with our designs. We work closely with our customers and take great pride in our highend designs and top-quality components.” One glance at Woodecor's new showroom and visitors instantly recognize this is no ordinary custom cabinet manufacturer. The cabinet makers' versatility is evident in the displays, which include a traditional kitchen, a rustic two-sided fireplace made of barn board, and a modern wall-hung vanity. And there's a traditional vanity with chrome Queen Anne legs that offers a mix of old and new. On the main floor, the spacious foyer and the open-concept kitchen and great room are bright and airy thanks to front-door sidelights, large windows across the rear wall and patio doors that open to the rear deck. The kitchen is sleek and modern with quartz countertops and laminate floors. Plush carpeting graces the great room. A timber mantelpiece, above a linear gas fireplace, adds rustic charm as does wood detailing on the breakfast bar and the barnboard-style doors on a kitchen corner pantry. While these features are aesthetically appealing, they're also truly green, Stolee emphasizes. The windows throughout the home are triple-pane, low-E argon for maximum insulation. They also let in an abundance of natural light. The PureBond kitchen cabinets, installed by Woody's Custom Cabinetry, use formaldehyde-free technology and soy-based adhesives. The quartz counters are provided by Caesarstone Canada, the first quartz surfacing company to receive a global standard certification for environmental protection. Even the deep Novanni sink is made from 90-percent recycled North American stainless steel; all the basins in the home incorporate high-efficiency faucets. Right Top: On the second floor, the staircase opens to a family-friendly activity room. Right Centre: The master bedroom ensuite bathroom features eco-friendly elegance. Below: On the main floor, the open-concept kitchen and great room provide a comfortable family living space with many green features. Murado laminate flooring is made from 100-per-cent recycled wood fibre. And the P.E.T. carpet is produced from recycled pop bottles. The fireplace features electronic ignition and battery back-up, saving on fuel. And the barnboard and timber accents are reclaimed wood. The second floor incorporates similar green features in the carpeting, cabinetry and counters in the main bathroom and master ensuite bathroom. It's also a family-friendly area with the staircase opening to a central activity room with built-in cabinets. Two bedrooms open directly to this area, while a hallway leads to the master bedroom. The inclusion of laundry facilities on this level is an added convenience. The lower level is finished with a recreation room, a fourth bedroom and a threepiece bathroom. This is also where many of the innovative technologies are situated. The house is heated by a hydronic air handler. This, Stolee explains, uses hot water from a tankless water heater to deliver a consistent flow of warm air through the house. He adds that the heating is zoned to allow separate temperature controls for each level. A grey-water recovery system – one of the first in a London residence – collects water from showers and laundry into a large tank, where it's filtered and chlorinated and pumped back to the toilets for flushing. “This can save between 30 and 40 per cent on the annual water bill,” Stolee says. Another first for a London home is a unique exterior air barrier, providing a tighter building envelope, he says. Rather than relying on the vapour barrier, traditionally installed on the inside of the framing to provide the air barrier, this new process uses foam sheathing applied to the exterior framing and sealed with a special tape. Since the house is completely airtight, a heat recovery ventilation system was also installed to draw fresh air in and expel the stale air. Outlets for this system are placed in “wet” rooms – laundry and bathrooms – to reduce moisture levels in those areas. FREE ESTIMATES. Licensed & insured. Old Castle Renovations is your full service solution! As part of LHBA's commitment to educate regional builders about green technologies, on-site workshops were held to explain these processes throughout the construction of the home. Additional cost savings were achieved by the use of LED lighting. These fixtures offer more than 60,000 hours of light and provide 70 per cent in energy cost savings, Stolee says. While he allows that upfront costs for some of the green features may be higher than traditional counterparts, he says “it's important to educate the public on the long-term savings in operating costs.” While solar systems were not installed, the home is solar ready, he says. “The necessary conduits have been built in and roof trusses engineered for solar panels so homeowners, if they wish, can incorporate that in the future.” Also new to the London area is a feature that protects health as well as the environment. A venting and mitigation system was installed beneath the house to prevent radon gas from seeping in. Radon is a colourless, odourless gas, prevalent in some areas of the earth's surface, that can leak into homes. Health Canada estimates that exposure to radon is the second leading cause of lung cancer, after smoking, and the number one cause for non-smokers. Stolee points out that it's not prevalent in the London area. However, installing the system is a requirement for LEED certification and, thus, was included. Following its own example, during construction of the home LHBA recycled all construction waste material through TRY Recycling. The green features in the home qualify it for triple-label certification – by Energy Star, Enerquality GreenHouse, and LEED Canada for Homes, programs that set high standards for energy efficiency, water conservation, air quality, environmentally friendly finishes and site sustainability. Many of the services and materials that went into this home were donated by local businesses. More information is available on the LHBA website at www.lhba.on.ca/lhbagreenhouse.html. FIREFLY FIELDS A PARK-LIKE SETTING IS A KEY ATTRACTION FOR A COUNTRY PROPERTY By Ellen Ashton-Haiste On a warm summer evening, fireflies light up the lawns, gardens and wooded groves of a rural estate north of Ailsa Craig. This prompted John Crosby, a sales representative with Royal LePage Triland Realty Brokerage, to dub it “Firefly Fields.” Situated on 78 acres – 20 of them workable farmland – the property is located halfway between London and Lake Huron, and borders the Little Ausable River. It includes one of the largest plantations of black walnut trees in Ontario as well as a spring-fed pond, ideal for swimming or just sitting and watching the bald eagles circle. Listed at $1.49 million, the property offers the best of both worlds for anyone anxious to escape the urban grind. It's completely private yet situated just 25 minutes from the city, Crosby says. In fact, the pastoral setting was a key attraction for the current owners, says Maggie Engel. “We love the country. The birds and wildlife are incredible. The other day 12 deer wandered through.” The Engels also wanted space to host gatherings with their children and extended family. “We had our daughter's wedding out back and it was wonderful,” she says. “It's so lush and green in summer.” The home itself – six years old and encompassing 5,000 square feet on two levels – is also perfect for such gatherings. Engel has hosted Christmas Eve sit-down dinners for 20. The home evokes a relaxed atmosphere combined with numerous upscale features. “We wanted a house that was comfortable and practical but with casual elegance,” Engel notes. On the main floor, 12-to-15-foot ceilings add volume to the rooms. The extended foyer, stretching from the front door to a Top Right: A main-floor office includes two walls of built-in cabinetry and large windows overlooking the front lawn. Right: The ensuite bathroom has birdseye maple cabinets, a soaker tub and an oversized shower. with kitchen, living & dining space to fall in love with. Above: The park-like rural estate includes the largest plantation of black walnut trees in the province. rear concrete patio, separates the openconcept great room and kitchen. Three walls of windows flood the great room with natural light. The great room also boasts a gas fireplace with I’m thinking if you couldbeneath and a cherry storage benches just floor-to-ceiling leave everything the cherry overmantel. sameAn and replace eat-in kitchen all features cherry cabinfo inetry aboutandClassic and which form granite counters, a recurring throughout the home. replace with theme the white An adjacent sitting area could be relogo and info I will attach purposed as a webpage bistro. the Company The main-floor for Reference.Themaster old adbedroom reits own deck with a hot tub and has treat the has Company phone an ensuite bathroom with and fax #. That won’t bean over-sized walk-in shower and aformal soaker tub. nessesary Just the Also on the main name and info. I look level are an office/den with two walls of built-in forward to a proof-thanks cabinetry, a powder room, laundry as always room, a three-piece bathroom, and a -large mudroom that opens to the attached two-car garage. The focal point of the lower level is a comfortable family room with built-in cabinetry to hold CDs or DVDs flanking a recessed alcove for the largescreen television. A walkout, through 12-foot patio doors, leads to the rear lawn and gazebo. This level also encompasses a bar and kitchenette, two additional bedrooms, a music room, which could accommodate a home theatre, plus a five-piece bathroom decorated in funky yellow and blue. In addition to the garage, a 40-by-60foot drive shed, complete with hydro, could be used as a workshop or for recreational vehicle storage. From original paintings to pottery, the studios, galleries and crafters that comprise the arts trail are ready to take visitors on an imaginative and unforgettable journey. The Old South Community Organization once again invites you to gather on the grounds of the historic Normal School in London’s Wortley Village. Join this community in celebrating their local talent on June 1st from 10am to 5pm. There will be lots of LIVE MUSIC. OVER 50 LOCAL ARTISANS – EXPANDED KIDS CORNER and TEA & SCONES ON THE GREEN. pottery studio nestled in a 54-acre pine forest, take an art class or a workshop at a fully functional studio, or purchase a piece of art from one of Elgin's several charming folk artists. Additional studios and galleries can be found in the seldom explored, yet ruggedly beautiful, western portion of the county where artists have an innate ability to capture the essence and history of rural life. The trail also features several talented artisans and crafters. Visitors can savour the sweet scents of hand-poured candles in the historic Quaker village of Sparta, visit a home built in 1842 in St. Thomas's West Village neighbourhood where fibre and yarn art is sold and displayed, or purchase a hand-crafted concrete garden statue in Central Elgin. The Elgin Arts Trail combines country charm with fine art. It also provides opportunities for those who appreciate art from afar and amateur artists wishing to actively participate in courses and workshops. Kathryn Russell is tourism development co-ordinator for the County of Elgin. Other products are built to be permanent, including ice walls and furniture that are found in ice bars around the world. The company designed and installed its own ice lounge in Hensall as part of the Ice Culture tour, where visitors learn about the entire process, from creating the ice blocks, through the design and production process, to seeing carvers in action with chain saws and hand power tools. Some of those tools were developed by Ice Culture, which has an active research and development department. Over the years it has produced many design and process innovations that are now used across the ice sculpting industry. A NATURAL FIT BREAST AUGMENTATION CAN ACHIEVE HIGHLY PERSONALIZED RESULTS By Heather Toskan Summer will soon be here and it's time for many women to look forward to their seasonal wardrobe of tank tops, camisoles, sundresses and bathing suits. It's also a time of year when many women consider enhancing their appearance with cosmetic procedures, including breast augmentation, according to Dr. Marilena Marignani, a plastic, reconstructive and cosmetic surgeon with a practice in London. â&#x20AC;&#x153;Breast augmentation remains one of the most commonly requested procedures amongst female patients in their late 20s to their late 50s. This type of surgery makes up about 40 per cent of my cosmetic practice,â&#x20AC;? says Marignani. Breast augmentation involves the surgical insertion of saline or silicone gel-filled breast implants into the breast tissue or chest muscle to change the shape and/or size of the breasts. Photo courtesy of Allergan Inc. Model is a mother of four children who has had Natrelle breast augmentation. Above: Natrelle Inspira silicone gel-filled breast implant from Allergan Inc. is available in more than 330 different options. “Many women choose breast implant surgery to correct sagging and to regain the firmness and volume that's lost after childbirth, breastfeeding and other life events such as aging and weight loss,” explains Marignani. Enlarging breast projection and increasing the firmness of the breasts is one of several reasons why many women elect to have breast implant surgery. Others with breasts that differ in shape or size frequently opt for breast implants to create a balanced, symmetrical bust line. Some wish to balance a pear-shaped figure, thereby achieving an hourglass-shaped figure and the increased confidence that may accompany it. “A desire for increased body confidence and self esteem are among the many personal reasons that lead women to choose to have breast implant surgery,” notes Marignani. Inspira breast gel implants are relatively new, round-shaped implants that offer a natural-looking fit and shape for many women as part of the Natrelle line of gel implants. Below: Natrelle Inspira silicone gel-filled breast implants from Allergan Inc. are shown in various sizes, shapes and projections. If you're considering breast implant surgery, the first step is to book a consultation with an experienced cosmetic plastic surgeon who will factor in your medical history as well as your desired outcome when recommending the appropriate type of breast implant and its placement. Breast augmentation is day surgery. Depending on the complexity of the surgery, it's best to plan for a postoperative downtime of two to six weeks, Marignani says. Heavy lifting and exercise regimens should be avoided for several weeks following the surgery. However, patients will be given a series of specific breast exercises to perform several times daily to help the breast implants conform naturally to their bodies. Non-invasive reduction of stubborn fat. No surgery...no lipo...no needles. Address and website information for the companies and/or retailers featured in the articles in this issue are listed by order of story below. (519) 245-6252, 39 Maitland Terrace, Strathroy, www.akkoltd.com. P. 37 A Leader in High-Tech and Backyard Swimming Pools Contact: Hollandia Pools and Spas, (519) 652-3257, 1891 Wharncliffe Rd. S., www.hollandiagardens.com. P. 38 Natural Light Patio Covers Contact: Ken Blokker, (519) 870-2240, www.naturallightpatiocovers.com. P. 40 Black, White and Bold Contact: Leslie's Clothing, (519) 679-1030, 551 Richmond St., http://lesliesrichmond.com; Susan J, (519) 679-8511, 256 Oxford St. E. P. 43 Fresh Start Maternity Supports Contact: (519) 637-0845, 118 Centre St., St. Thomas, www.fsms.ca. P. 55 Thomsen’s Decorating - Helping Homeowners Create Professional Results Contact: Thomsen's Decorating Centre, (519) 268-1945, 2135 Dorchester Rd., Dorchester, www.thomsens.ca. P. 57 A Passion for Innovation Contact: Woodecor, (519) 271-2700, 2980 Forest Road, Stratford, http://woodecor.ca. P. 60 Green Home - LHBA is Building a Greener Future Contact: Randy Pawlowski, (519) 679-5431; www.lhba.on.ca/lhbagreenhouse.html. The home, at 1511 North Wenige Dr., is open Sundays 2 p.m.-4 p.m. P. 65 Skin Care Products Good Enough to Eat Contact: Jaydancin, (519) 203-1333, 2454 Main St., Lambeth, www.jaydancin.com. P. 66 Lifestyle Distinctive Property for Sale – Firefly Fields Contact: John Crosby, Royal LePage Triland Realty Brokerage, (519) 685-4190, www.johncrosbyproperties.com. P. 71 The Constant Painter: Maya Eventov Contact: Artisan's Alley, (519) 434-7112, 430A Richmond St. P. 73 Fantasies in Ice Contact: Ice Culture, 1-888-251-9967, 81 Brock St., Hensall, www.iceculture.com. P. 75 A Natural Fit Contact: Dr. Marilena Marignani, (519) 438-1130, 272 Oxford St. W.
Renovate the existing closed-off and dark kitchen and family room to create an open, family friendly space, perfect for casual entertaining. Removing the load-bearing wall between the kitchen and living room really opened up the two spaces, and decorative columns that match the cabinetry camouflage the structural steel posts. Contrast has been created by using dark and light cabinetry, and the large kitchen island doubles as the hub for entertaining so friends and family can be part of the action (but out of the chef’s way!) For more innovative renovation ideas, please visit our online renovation gallery.